My husband has ADHD. I've read that people with ADHD are much more likely to get divorced, and I certainly know why. This is our story. We met at a pirate-themed historical dance. 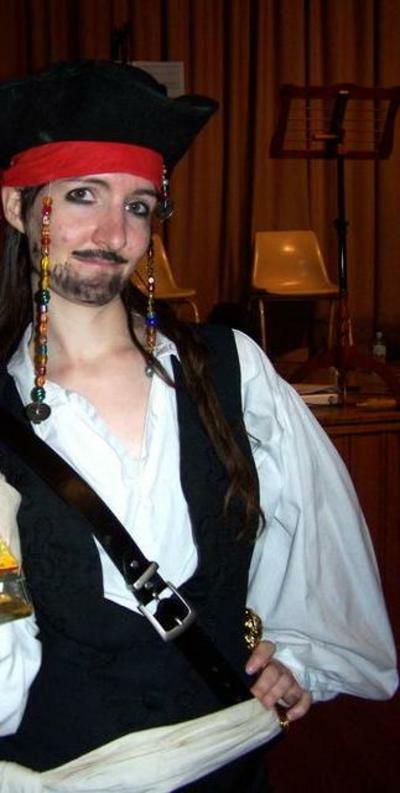 I was dressed as Captain Jack Sparrow - including a very fetching beard I'd drawn on with mascara (feel free to use that tip when you're in need of a nice facial adornment in order to find a husband). I took a liking to him during our first conversation, and later the same night he mentioned he didn't drink due to his ADD meds. "ADD," I thought. "Good. He'll fit in with my friends." Most of my friends are type "P" on the Myers-Briggs Personality Test - meaning that they're more focused on the journey rather than the destination. In conversational terms, this means that they can drive people crazy as they run off on tangent after tangent - often in the middle of someone else's sentence. To some, that's a vibrant, thrilling conversational ride. To others, we're incredibly rude and make no sense. We've been married six years now and have two children who so far don't seem to have any ADHD symptoms. Before we married, I told Chris that the most important thing for us to stay married was that I needed to never, ever feel like I was his mother. He needed to do his jobs on his own, without me prompting him or having to ask him to re-do something. So much for that. When I get up in the morning and walk into the kitchen to get my breakfast, I finish the things he's left undone from everyone else's breakfast. At the moment that's usually rinsing out a plastic bib so the baby can use it again in three hours; hanging up the smelly dishcloth before it gets mouldy; putting the pre-schooler's milk bottle into the fridge so we can re-use it instead of having five crusted bottles around the living room each evening; and wiping down the high-chair, etc. All things I do at morning tea, lunch, and afternoon tea while on my own. 90% of mothers reading this will be staring at the beginning of that paragraph, trying to make sense of the opening sentence. "Wait. . . everyone else has breakfast before she gets up!?!?! How is that possible?" Yep, I stay in bed for an extra hour while he makes breakfast for two kids. Every day. Of all his redeeming qualities, that's got to be in the top five. So as I wrestle two little ones around the house all day, and I find myself scanning every single room for health hazards and half-done chores to correct along the way, I'm grateful for the husband I have. It's a funny blessing to marry someone with a medical condition that has such a dramatic effect on his behaviour. I never quite know if he's being a lazy inconsiderate jerk or if it's just the ADHD. So he looks after me, and I look after him - and mostly we do all right. I fully understand, I was married to ADHA. It did not last because I just could not cope. My son from that marriage has ADHD, so I know now! and after 22 years of being a single Mum....with a son who really has it full on, I understand too well. It is a complex journey, few people will see 'how' it works in our lives, but it does. My son has to have his t.v. on 24 hrs a day!, hates going out, and has not had a full time job yet at 22...He refuses to learn how to drive, and I have to drive him everywhere. He won't help around the house unless I really ask over and over, and even then may not. Yet! he gives of his time to children who are from troubled homes, and has gone to Tafe for 2 years learning Community Services. Chris took 9 years to finish uni (single subject) and still would have failed except I finally stepped in and said, "Can I help?" I spent about thirty hours sitting in a room with him saying, "Back to work. Back to work. That's nice. Now get back to work. Why are you walking around? Get back to work." He was still living at home at that time, so would have been 26. When I said to his mum, "How will you feel when Chris moves out?" She said, "Surprised." His dad also has ADD. Fingers crossed for our son.